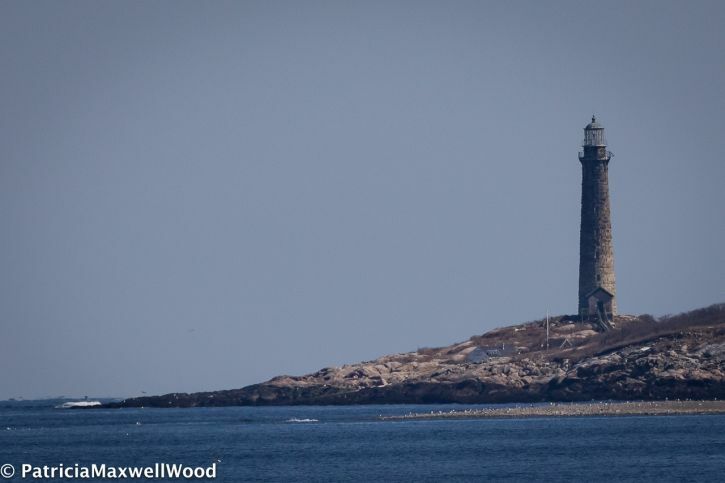 Posted on March 18, 2019 by David M.
David Larson and I led this week’s Wednesday Morning Birding program around a share of Cape Ann. This was our final trip for the season to Cape Ann, ergo, no more Harlequins until November. In the meantime, we will continue to enjoy scoters, Long-tails, Buffleheads, and goldeneyes, at least for a little while, from Plum Island. 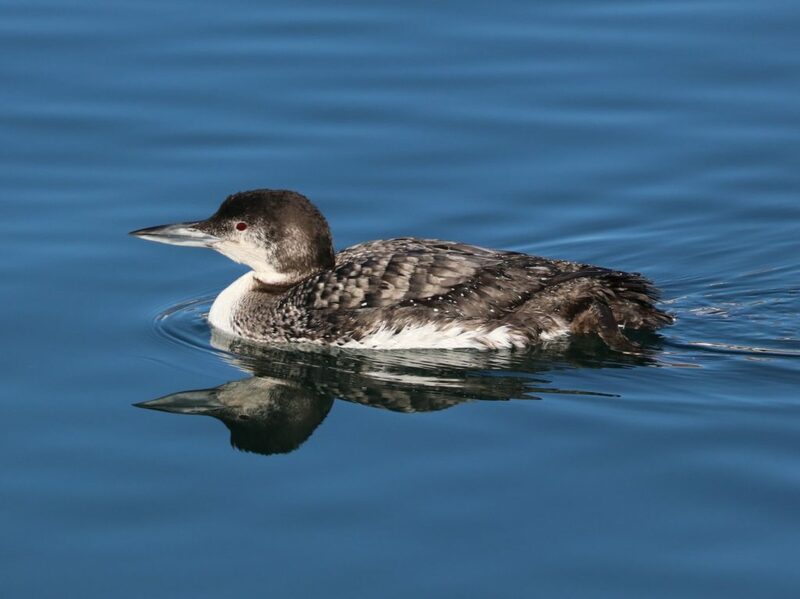 On this absolutely gorgeous morning, from Jodrey Fish Pier, we saw a few Common Eiders, a Red-breasted Merganser or two, a Common Loon, and a small group of eight Surf Scoters within good viewing distance. Gulls were, of course, present, but not in big numbers as in times past. Oh, my, it’s not very often that we have calm conditions on Cape Ann, but this time around there was minimal wind. The flat-calm water, at this low tide, allowed us to actually see the bottom of the harbor from the pier. Eastern Point was wonderful with the variety of birds present. 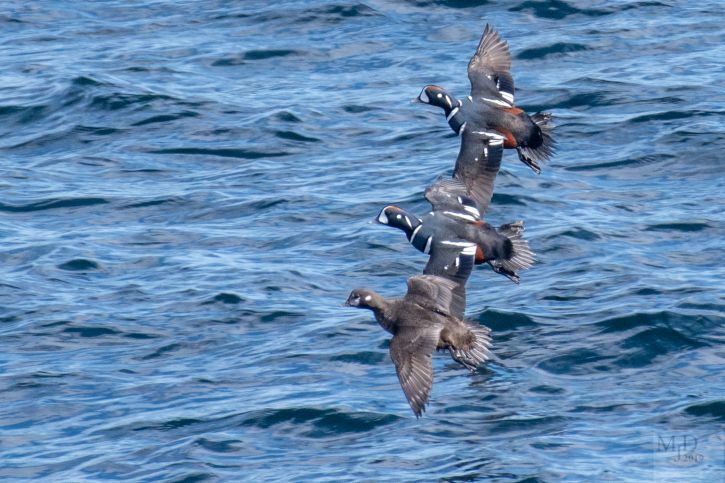 We saw big flocks of Black Scoters, Common Eiders, and Long-tailed Ducks. There were lesser numbers of Surf and White-winged Scoters, but impressive numbers, nonetheless. This spectacle was indicative of a gathering of the various seaducks preparatory to their migration to their northern nesting grounds. On the far side of the outer harbor, we were able to find five Razorbills, their smaller black-and-white bodies evident in the bright sunshine. 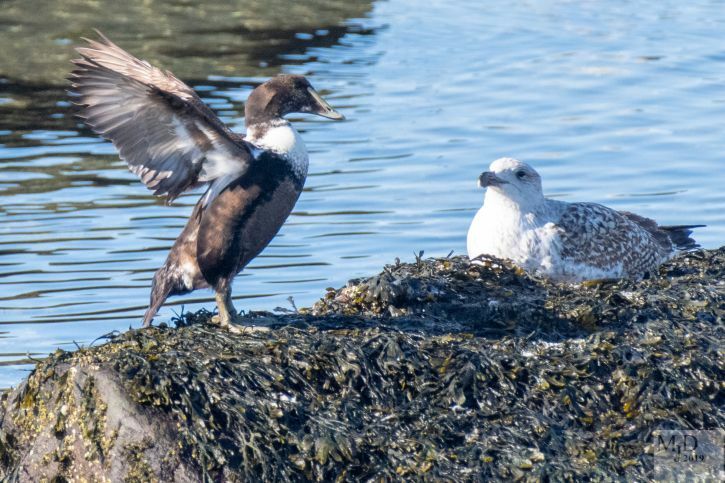 Near the end of the Dog Bar — the big Gloucester Harbor jetty — keen eyes with good scopes found a small flock of Purple Sandpipers loafing in the morning sun. A few Gadwalls were present nearby, as they usually are. Other dabbling ducks present were a pair of Mallards and a few American Black Ducks, one pair included a “Blallard” drake — a black duck-Mallard hybrid, with some Mallard green evident in its head and one of its tail feathers showing the typical Mallard curl. Otherwise, it looked very much like a black duck. Other divers in view were some Buffleheads and Red-breasted Mergansers. In the marsh to the north of us, a few Red-winged Blackbirds could be heard singing and there were several Common Grackles. Making our way along Atlantic Road, we made a stop at “Cormorant Rock” where we usually find Great Cormorants loafing. We were not disappointed. Sitting atop the rock were five adult Great Cormorants and two immatures. The adults displayed their nuptial plumage with their white flank patches and heads and necks turning a frosty white. The dark chests and white bellies of the immatures were evident. 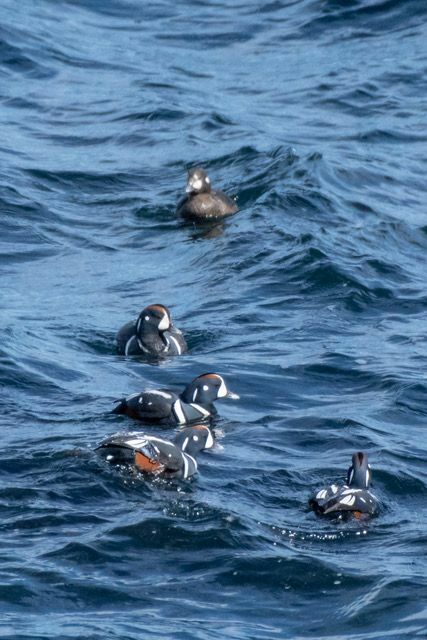 In the vicinity of the rock was a pair of Harlequin Ducks, which we don’t normally see on this stretch of coastline. There were also a few Common Eiders and White-winged Scoters. For those not entirely focused on the ocean, two Song Sparrow were heard singing in the background. From our Elks Club vantage point, we managed to locate two Black Guillemots — one in nearly complete black breeding plumage and the other still in its dominantly white winter plumage. Four Red-necked Grebes and a single Horned Grebe were also present along with the usual duckies. A few Purple Sandpipers right in front of us presented great views as the incoming tide approached them. Following the requisite pit stop at the Rockport public loos, we visited Cathedral Ledge. Here we had stunning views of Harlequins directly below us. The sun height and angle made the drake plumages utterly breathtaking — absolutely gorgeous. Their wintering numbers are dwindling as they make their way north for the breeding season, so we were very happy to have these birds giving us a show, the last of our season. David Moon and I look forward to seeing you next week back at Joppa Flats Education Center. The arrival of early spring migrants is underway and resident bird song is being heard! 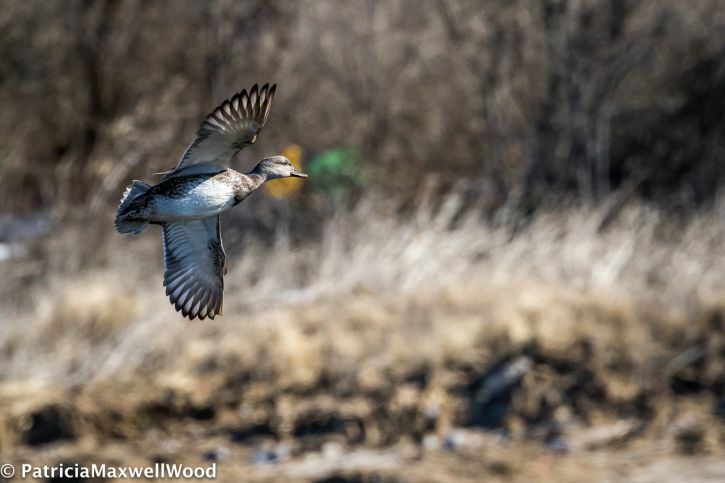 Gadwall (3) – Eastern Pt. American Black Duck (~ 15) – various. Mallard (2) – Eastern Pt. Harlequin Duck (12) – 2, “Cormorant Rock,” Atlantic Rd. ; 10, Cathedral Ledge. Horned Grebe (1) – Elks Club. Red-necked Grebe (4) – Elks Club. 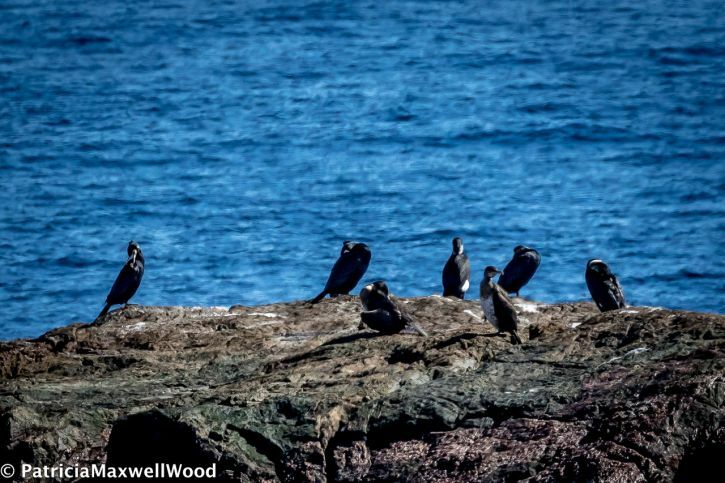 Great Cormorant (7) – “Cormorant Rock,” Atlantic Rd. 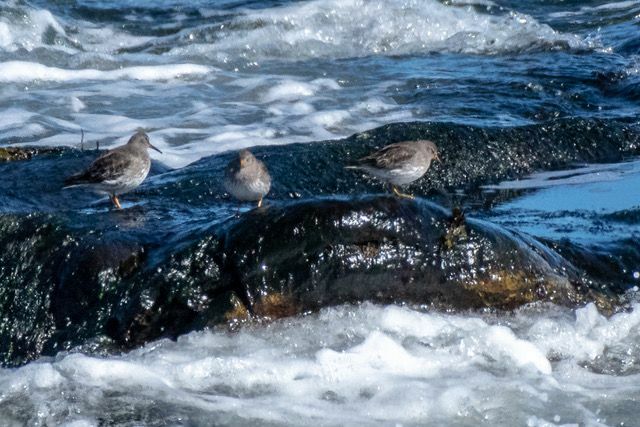 Purple Sandpiper (~ 20) – ~ 16, Eastern Pt. Dog Bar; 4, Elks Club. Razorbill (5) – Eastern Pt. 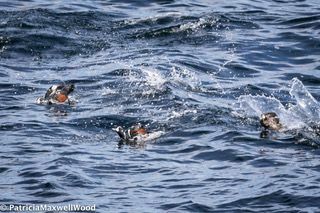 Black Guillemot (2) – Elks Club. Northern Mockingbird (1) – Cathedral Ledge. European Starling (~ 6) – Eastern Pt. Song Sparrow (3) – singing; 2, Atlantic Rd. Northern Cardinal (1) – Cathedral Ledge. Red-winged Blackbird (3) – Eastern Pt. Common Grackle (~ 6) – Eastern Pt. 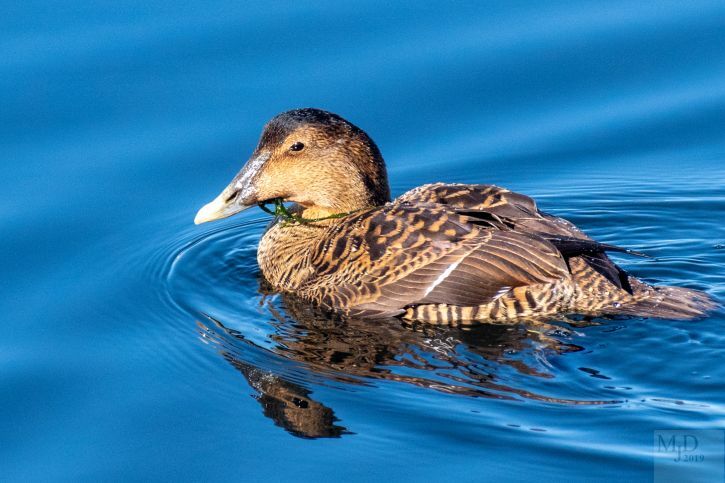 This entry was posted in Birding on March 18, 2019 by David M..